“There has been a lot of speculation recently about the future of the Club and, in particular, whether we have been in negotiation with Martello Developments. This statement is intended to set the record straight. Martello Developments have purchased the building next to the Club (this is the end plot, to the north east) with a view to development. They have also expressed a strong interest in purchasing the Smuggler Public House – again with a view to development, if planning permission can be obtained. In conjunction with the former, the Club Trustees have been involved in discussion with the company. This is purely in relation to matters arising from our status as neighbours, and has included future arrangements for sewage disposal (our cess pit is within their boundaries) and the physical appearance of our building – which could impact upon the desirability of new dwellings. During these negotiations, the developer has – understandably – expressed an interest in buying our plot if it became available. There would be clear commercial benefits arising from them owning adjacent sites. They have, however, been told that our Club is not for sale. There has been no offer made for the Club, and no suggestion that the Smuggler may be offered in part exchange. The New Beach Club is a family-friendly social club nestling under the sea wall in Pett Level. 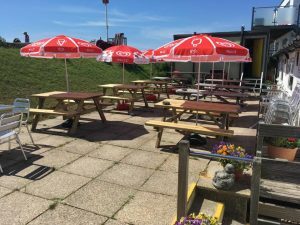 The Club boasts direct access onto the beach and the countryside on a spectacularly beautiful part of the East Sussex coast and indoor and outdoor seating areas. There is always a warm welcome from our bar team and we offer quality drinks at club prices. 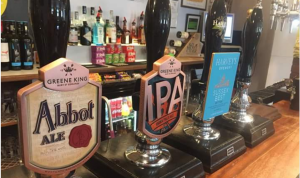 We are proud to be Cask Marque accredited for our real ales, Harvey’s Best is our regular bitter with Harvey’s Old during the winter plus ever-changing guest ales, including Greene King Abbot Ale, Wells Bombardier, Sharp’s Doom Bar and others. Plus Guinness; Stowford Press and Thatcher’s Ciders; Foster’s, Beck’s and Stella Lagers. We also offer freshly-ground coffee and a selection of bar snacks. Natalie in the kitchen offers an excellent home-cooked menu and there is always something new on the specials board. Members are treated to regular live music throughout the year from popular local bands, generally on alternate Sunday afternoons. Regular social events include Monday Quiz Nights, free pool table Wednesday evenings. Recreational facilities include a pool table, dart board and fruit machine, and cribbage and shove boards available too. Use of the club as a venue is free to Members. Further information from the bar staff. Well behaved children and dogs on leads are welcome. Home to the New Beach Sea Angling Club, whose members’ boats can be seen lined up along the sea wall, regular sea angling competitions are held and the excitement of “weighing in” the catches is always an interesting and fun spectacle. Strolling along the beach? Why not pop in for refreshment and find out about membership. Joining is simple if you like it here and Annual Membership is just £18 for an individual or £32 for a couple. Weekly and Daily Temporary membership is also available for short term visitors at £3 per person per week or £2 per day. MEMBERS — Please use the form on the ‘Contact Us’ page to let us know your email address and keep up-to-date with what’s going on at the Club by checking out our ‘What’s On’ page. The New Beach Club, Pett Level, Nr. Hastings, East Sussex TN35 4EH. Copyright © The New Beach Club 2019.